With the weather on the East Yorkshire coast looking dark and dire, I’m searching through my cookbooks and magazines for some more warming and comforting food to cheer us up. We have been working so hard on our house, especially our lounge, and are within a week of having a lovely room to sit in, on a comfortable settee, and will be able to light up our new log burner. But it has taken longer than expected, and every muscle aches from sanding, cleaning, painting etc, so more comfort food is what we need. More Comfort Food is definitely needed in our house. Here is another soup I’m really looking forward to. This butternut squash soup sounds perfect to warm you up on a miserable wet day. The heat of the chilli will certainly do that, but use it wisely and if some of the family don't like too much heat, serve the extra chilli on the side for those who want it. For hearty eaters, add some crusty bread to make it a more filling meal. Heat oven to 200C/180Cfan/Gas 6. Cut the squash into large cubes, about 4cm/1 1/2in across, then toss in a large roasting tin with half the olive oil. Roast for 30 minutes, turning once during cooking, until golden and soft. While the squash cooks, melt the butter with the remaining oil in a large saucepan, then add the onions, garlic and 3/4 of the chilli. Cover and cook on a very low heat for 15 - 20 mins until the onions are completely soft. Tip the squash into the pan, add the stock and the creme fraiche, then whizz with a stick blender until smooth. For a really silky soup, put the soup in a liquidiser and blitz it in batches. Return to the pan, gently reheat, then season to taste. 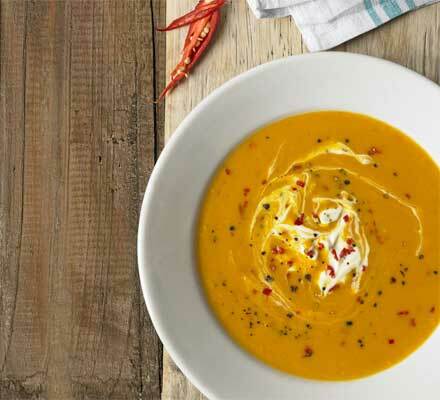 Serve the soup in bowls with swirls of creme fraiche and a scattering of the remaining chilli. More comfort food to warm us on a cold, wet day, and this one is perfect for Erik and myself to rustle up, after another day of strenuous physical work (I’m sure we’re too old to be doing all this!). 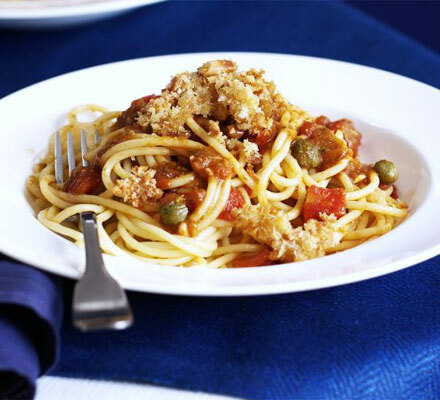 Pesto & Tomato Pasta with Crispy Crumbs. Gently cook the onion and half the garlic in 2 tbsp olive oil for 10 mins until soft. Stir in the tomatoes and sugar and simmer for 15-20 mins until a sauce consistency. Stir in half the pesto, some seasoning and a few capers or olives. Cover and keep warm. Meanwhile bring a large pan of salted water to the boil and cook the pasta. Check the timings on the pasta packet - it can vary immensley between 6 mins to 12 mins, so keep checking the pasta in the pan. While the sauce is simmering, heat oven to 220C/200CFan/gas7. Toss the crumbs in a large baking tray with the remaining 2 tbsp olive oil, the rest of the garlic, the pine nuts and Parmesan. Roast for 10 mins, stirring a few times, until golden. (Watch carefully to make sure they don't burn). Dot the butter over the crumb mixture and return to the oven for 2 more mins. Drain the pasta, reserving a little of the cooking water, but drain the pasta very thoroughly. Keep pasta warm, and then stir the reserved cooking water through the tomato sauce, add more pesto, then add the pasta and mix gently. Serve in large bowls, and scatter the Crispy Crumb mixture over the top of each serving. Well, that’s a bit more comfort food to keep us all warm. None of these are difficult to prepare or cook, which is useful when we’re all busy. The Butternut Squash could have the addition of carrots and sweet potato to fill it our, the Pasta dish could have crispy panchetta added – so many recipes can be adjusted to suit different tastes, and I’m sure you enjoy playing about with them and making them your own ‘special’ recipe as much as I do. Hope you enjoy them.